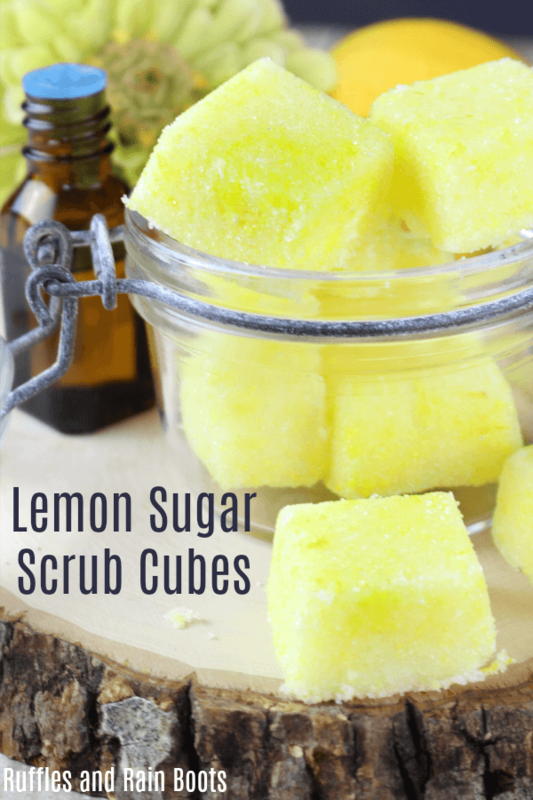 This lemon sugar scrub recipe is made into cubes making gift-giving easier or just making less of a mess when you need a good exfoliating pampering. When made in cubes, however, I don’t have to worry about dumping scrub on my counter or the rim of the tub. I also don’t have to worry that I’ve left any moisture inside the jar with the scrub because I get a cube out before I get in the shower or bath. 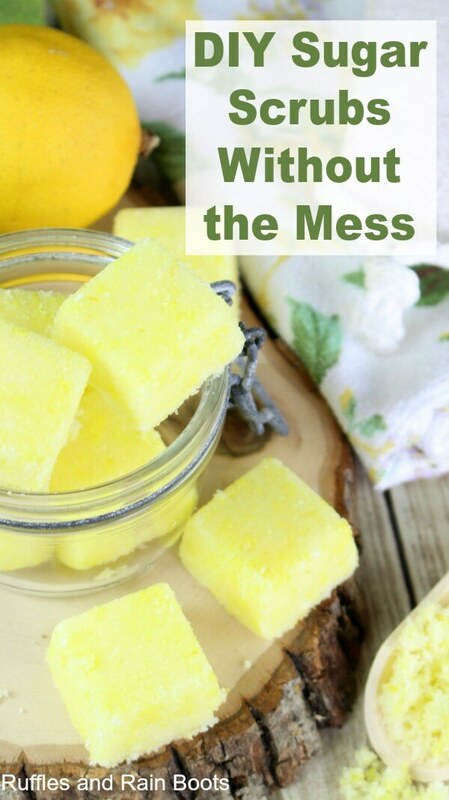 Whether you’re making these lovely lemon cubes for yourself or another, trust me that the cube is a better option. 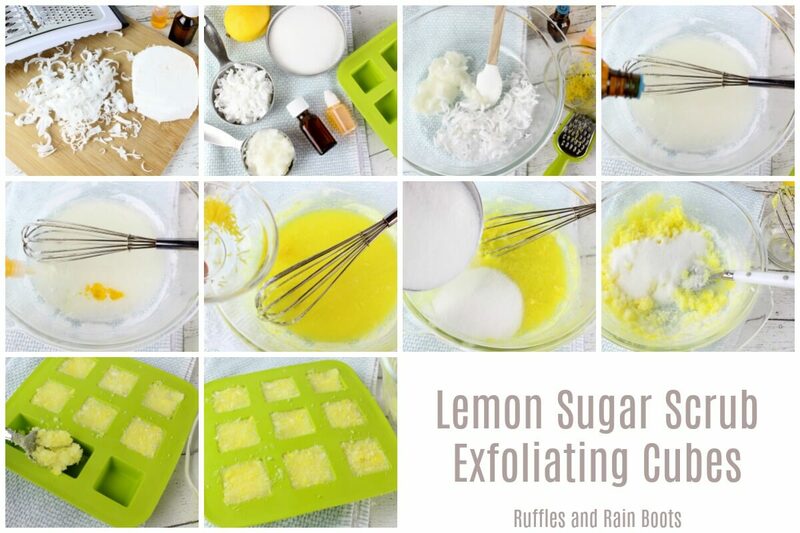 RELATED READING: Lemon Vanilla Bath Bombs – Easy and Wonderfully Scented! 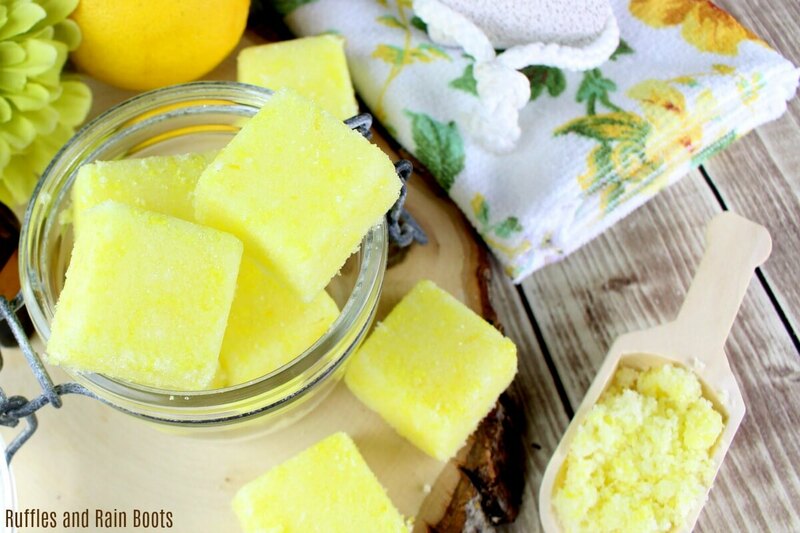 You can use any mold for your lemon sugar scrub cubes, but make sure it is silicone. This cube mold is what we used and the cubes just pop right out! Because we make all of our own bath products here on Ruffles and Rain Boots, we’re sharing all of our favorite supplies in our Amazon Shop. Shred or cut the shea butter into very small pieces and place it in a microwave-safe bowl with the coconut oil. Microwave in 30-second intervals until melted. Add the lemon oil, zest, and soap colorant. Mix well. A note about coloring: adding white sugar will lighten the mix considerably. 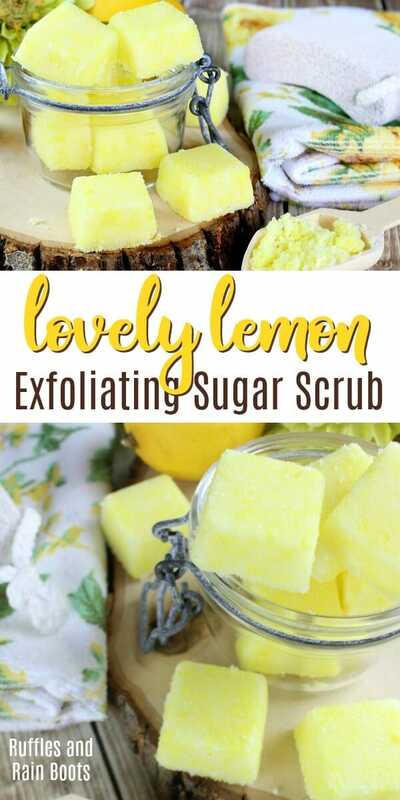 If you want a bright yellow sugar scrub, add a generous amount. Next, add in the sugar and mix quickly. The liquid will harden once the sugar is added. Freeze for 1 hour to let the cubes harden. Release the exfoliating sugar cubes from their molds. Store in an airtight container. Remove 1 or 2 from an airtight container. Gently crush them in your hands – you don’t need to crush them completely. Massage the mixture over your skin in a small, circular motion. Rinse with warm water and pat dry. Follow up with your favorite moisturizer. How Long Will Sugar Scrub Cubes Last? As long as you don’t change the oil I used in the recipe, they should last at least 6 months with no change to scent or texture when stored in a completely airtight container. A general rule of thumb is that a non-water-based sugar scrub has a shelf life of the carrier oil used. For example, if you were to use hazelnut oil the scrub would only last 3 months maximum. If you are making these for yourself, good job. But if you happen to be making them for someone else, here are a few ways to package up and gift your sugar scrub cubes. Note: if you’re gifting these, include a note with the instructions for use above. Once you’ve made the sugar scrub cubes, stash them in an airtight container. We love keeping ours in apothecary jars with an airtight seal. 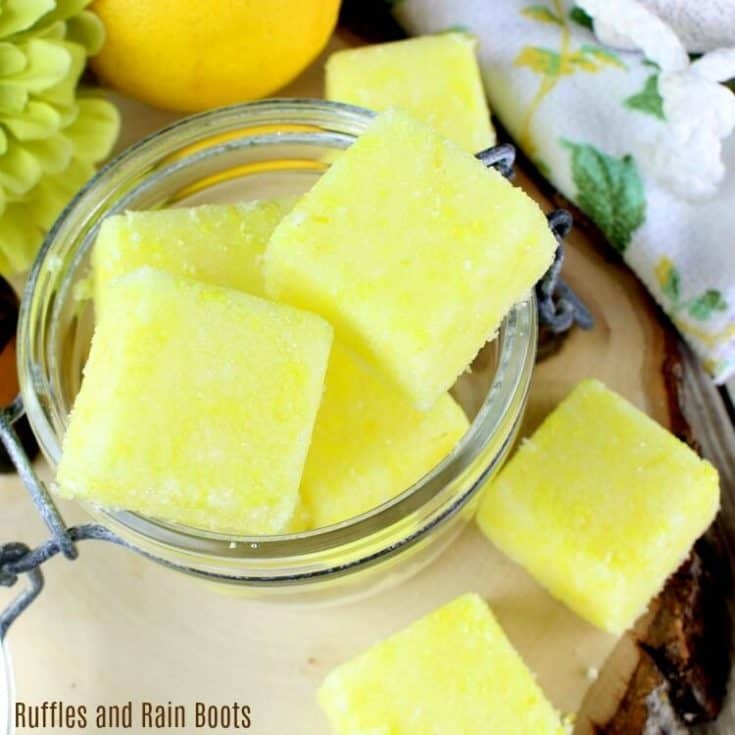 Pair them with our easy to make lemon vanilla bath bombs. Place all items in a small basket with a loofah and some lemon pound cake tea. Oh my goodness, this tea is divine! Mason jars are the crafter’s Swiss Army knife. Buy a mason jar and a small fabric swatch from the fabric store. You can either buy what’s called a “fat quarter” or peruse the fabric in the stacks and get 1/8th of a yard cut. Either way, cut a circle 50% larger than your mason jar lid and tuck it over the top and under the ring. Put a coordinating ribbon on that thing and you have a swoon-worthy presentation done in minutes. RELATED READING: Mermaid Bath Bombs That’ll Impress the Heck Out of Anyone! How long do these last before you would consider them expired? I’m thinking Christmas this year for gifting. Sindy, I’ll add some information to the article to make sure to answer it for everyone. As long as you don’t change the oil I used in the recipe, they should last at least 6 months with no change to scent or texture when stored in a completely airtight container.